Forever is a beautiful word. When our reference point is God and His Kingdom, everything takes on an eternal perspective. Life is filled with meaning and packed with purpose. Those who have this world as their reference point see only those things which are temporary, short-lived, and passing away. 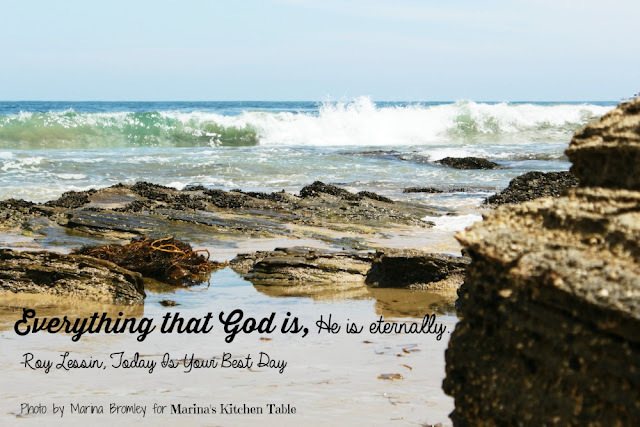 Everything that God is, He is eternally. He is love, and He loves you all the time. He is good, and He is good to you all the time. There are no ups and downs, highs and lows, or comes and goes with God. What He was to you yesterday when He showed you mercy and grace, He will show to you today. The acceptance you knew when He lifted you out of your sins is the same acceptance that upholds you today. The arms that were once around you to give you assurance embrace you today. All the delights of His presence, all the joys of His face, all the gladness of His heart, rest upon you today. You can sing and rejoice in the Lord forever. The God you trust reigns forever. God will be with you forever. You will be with the Lord forever. God will be your God forever. The One who is in control of your life is King forever. God's plans and purposes stay firm forever. God's Word is true forever. God's goodness and unfailing love will be yours forever. God knows your name forever. You will live in the house of the Lord forever. Your eternal reward will last forever. Your love relationship with Jesus will go on forever.